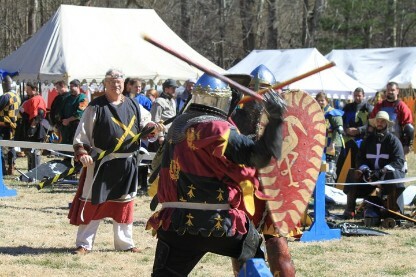 Sir William marshaling a tournament to determine the next King. fighting with spears in melee . at Mt. Trashmore park in Virginia Beach. 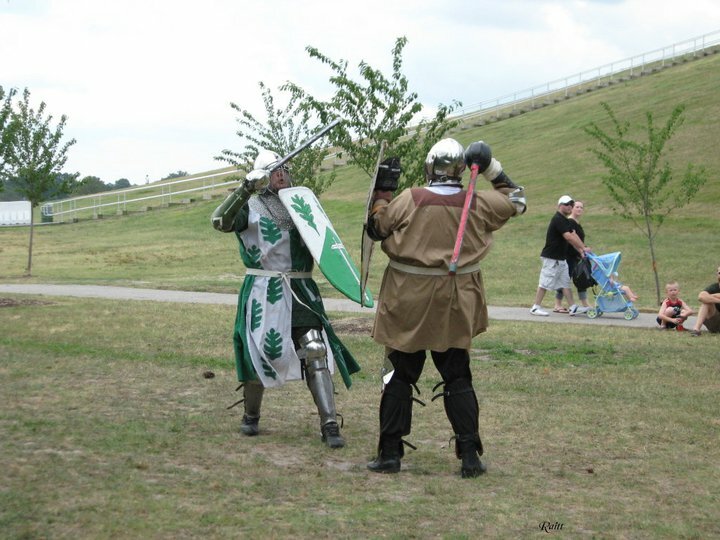 Lords and Ladies of our Society engage in full speed, full contact, and un-choreographed martial combat called “Heavy Armored Fighting” which is a unique art and sport. Yet, thanks to the nature of the armor and weapons, combatants come out of these brutal "deeds of arms" unscathed and ready to do it again. Nowhere else will you be able to enter into contests of skill with the raw intensity that you can in the SCA. After safety, honor is the most important aspect of heavy list fighting. Our combat system is one based upon recognition of blows received. Victory is never taken, but rather it is given by the man-at-arms in recognizing the worthiness and skill of their opponent. This culture of combat is one of great justice and trust because it places weight upon the honor and integrity of all involved. Rattan--similar to a solid bamboo--is used to construct the wide array of weapons (sword, axe, spear, mace, poll-arm, the sword of war or great sword, dagger, and others) that are used by SCA Armoured Fighters during combat. Instead of snapping and splintering, rattan fibers separate along the length making them look a lot like a broom when they wear out. Most new fighters choose to begin with sword and shield but many branch out quickly into the use of one or more of these chivalric weapons, finding different paths, and challenges. Armour in the SCA is fashioned after historical examples and made of a variety of materials: metals, leather, and plastic--with modern equipment hidden as much as possible to maintain an authentic appearance. 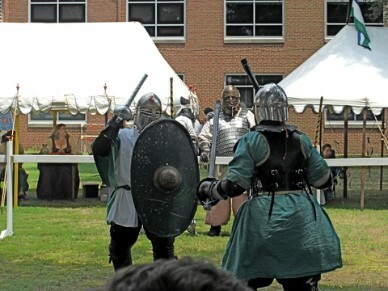 Whether one chooses to portray a Norman Knight, a Saxon Thegn, a Norse Huscarl, a Byzantine Cataphractos, an English Esquire, or any other variety of man-at-arms is immaterial--in the SCA all of these coexist on the same battlefields and lists together. For Official Rules, Regulations & Other useful links about Heavy Armored Combat See the Kingdom's Policies & Rules.